If you've ever found yourself running out of burners on your cooktop (or pots to cook with), you can free up space on your stovetop by cooking rice in the oven. Rice cooked in the oven cooks evenly, so you won't end up with burnt rice stuck to the bottom of your pot. You can cook brown rice or white rice using this technique. A Dutch oven is a good choice. But you can also use a shallow baking dish or pan with a lid, as long as both pot and lid are safe for both stovetop and oven. If you don't have a pot with a lid, you can use a baking dish covered tightly with foil and it should work just fine. A transparent pot is perfect for this because you can tell at a glance how much liquid is left in the pot. Removing the lid releases steam, and if it turns out the rice isn't done yet, it will take that much longer to bring it back up to temperature. If you're lucky (i.e. you've got a good oven light and a clean oven window), you can check it without even opening the oven door. Start with one cup of uncooked rice. This will be enough for four regular servings of rice. To make a double batch, just double all the quantities given here (but not the cooking times). Rinse the rice with cold water until the water is clear. You don't absolutely need to rinse the rice, but doing so removes excess starch that can make the rice come out sticky. The flip-side is that rinsing the rice washes away some of the nutrients that are added to the white rice. The choice is yours. Note that you don't need to rinse brown rice. Bring your liquid to a boil on the stovetop. For white rice, boil 1 2/3 cups of liquid. For brown rice, you'll need 1 3/4 cups. Add 1/2 tablespoon of butter to the liquid as well as 1 teaspoon of Kosher salt. If you're cooking with stock as opposed to plain water, you might want to use less salt (or none at all), depending on how salty your stock is. Once your liquid boils, add the rice, cover tightly and transfer it to the oven. Or if you're using a separate baking dish, combine the water and rice in the dish and cover it either with a lid or a piece of foil and transfer it to the oven. Bake 25 minutes for white rice, or about an hour for brown rice. The rice should be tender but not mushy, and all the liquid should be absorbed. If it's not done enough you can bake it for another 2 to 4 minutes. When the rice is cooked, fluff it with a fork to let the steam out. 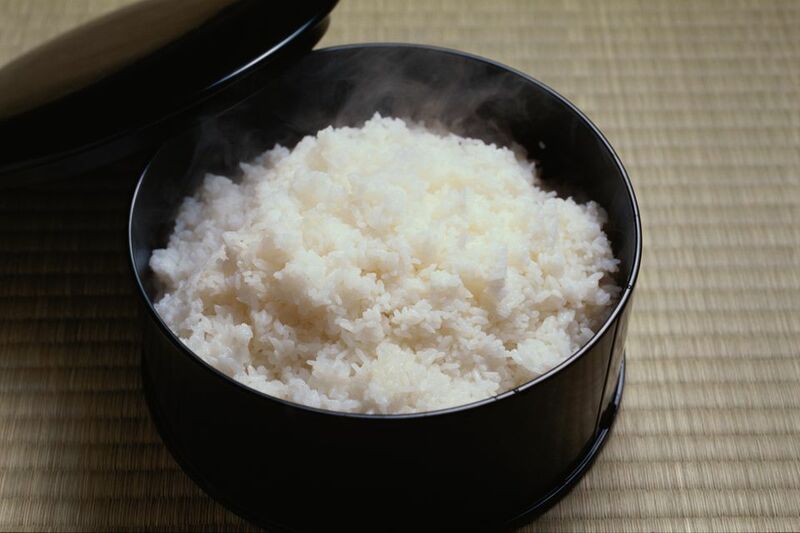 This is an important step because the built-up steam will continue cooking the rice and cause it to overcook. For a variation on this technique, try the pilaf method, which involves sautéeing the uncooked rice before adding the liquid and then transferring it to the oven.